To view the latest TradeLines newsletters containing new product and painter related information and humour, click on the issue of the newsletter you wish to view. Issues start from issue 2 each year as no newsletter is printed during the holiday period. To view TradeLines you will need Acrobat Reader. Cinderella Trade - from NZ Painters and Decorators 1958, reprinted with permission Master Painters New Zealand. View article. 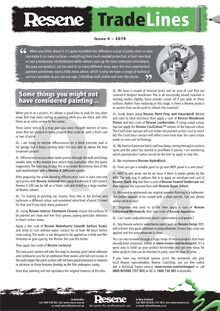 Click on the article/s below for information of interest to professional painters. While a professional marketer can certainly add a depth of knowledge to any small business, there are still a number of skills you probably already have that can help boost your trade. The trick is to remind yourself that they are in fact marketing assets, and to ensure you use them as much as possible. How can professional painters better manage cashflow? As a small business, staying financially afloat can be a tricky task for many. In Australia alone, small businesses have the lowest survival rate (56 per cent), according to the Australian Bureau of Statistics, with experts blaming poor cashflow management as an overriding issue. So you've set up your business, built up a great reputation, and have steady work coming in. The question usually comes down to: What's next? As much as any trade is all about physical skills and tools, a lot of your branding and marketing is locked behind a digital screen. New to social media marketing? Discover some of the top do’s and don’ts for small businesses in the tradie or painting trades.